Our exceptional and unique Bird Feeder Pole Systems come as complete bird feeding systems with bird feeders and poles together. 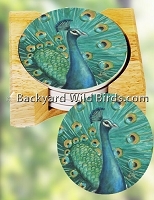 Wouldn't you like to have one in your backyard and see all the wild birds? They have all the elements for successful birding already incorporated in them. 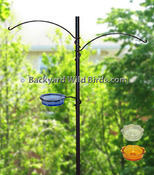 Wild Bird feeding is a joy with these effective Squirrel Stopper pole systems. These distinctive Bird Feeder Poles designs can come in various sizes and styles such as: Squirrel Stopper Pro, Squirrel Proof Poles, Raccoon Proof Poles and Shepherd Staff poles. Also included in the Bird Feeder poles category are styles such as: Deck Bird Feeder poles, Post Bird Feeder poles, Bird Feeder Hanger Arms and Small Bird Feeder Station poles. Bird Feeder Baffles are one of the most overlooked but important parts of a bird feeding solution. Squirrel Baffles are simply a device to block squirrels from bird feeders. Hanging Baffles give protection from weather. Pole Squirrel Baffles stop squirrels and raccoons from climbing up the pole. Well designed quality Bird Feeders are at the heart of bird feeding. The bird feeders must attract a variety of birds and be easy to maintain. They are of value when they last and deliver the seed that brings natures best wild birds right to our backyard. All of the popular styles can be seen at the main category Bird Feeders. Most Bird Feeders can be made into Squirrel proof Bird Feeders using the right Squirrel Baffles or Bird Feeder Poles. Bird Feeders we've chosen from each category excelled in what birders want in bird feeders. The features that set them apart are emphasized to make selection easier. Window Bird Feeders are an excellent way to bring the birds up close for a great view. Check out how to Attract Hummingbirds To Feeders in our 'Birding Info' section to learn all about Hummingbirds and then bring them to your backyard. Also has tips and information on why ant guards are essential with Best in Class Hummingbird feeders. Hummingbird Feeders also make excellent Window bird feeders and gifts. Bird Baths and Bird Housesprovide life giving water and shelter from the weather. Using bird baths and bird houses will keep songbirds coming back to your backyard bird sanctuary. Grouped together in a Squirrel Stoppers category are representative examples of the many ways to have squirrel proof bird feeders. Squirrels can be great fun to watch especially when they are unsuccessful at trying to raid our bird feeders.